You can expect that your trip will be full of engagement, service, and learning. You can learn more about each of these facets of your trip below. Memphis Grizzlies Basketball, Memphis Redbirds Baseball, Levitt Shell, Overton Park, Shelby Farms Greenline, Shelby Farms Park, Beale Street, Peabody Hotel, Graceland, Pink Palace, Brooks Museum of Art, Dixon Art Gallery, Libertyland Disc Golf Course, Memphis Escape Rooms, Rec Room, Find Memphis Murals. Memphians take pride in great local restaurants. Skip the chains and eat local! The National Civil Rights Museum is a staple of the Serve901 experience! The museum is a unique and powerful learning experience that focuses on the American Civil Rights Movement. It is located at the former Lorraine Motel where Martin Luther King Jr. was assassinated on April 4, 1968. 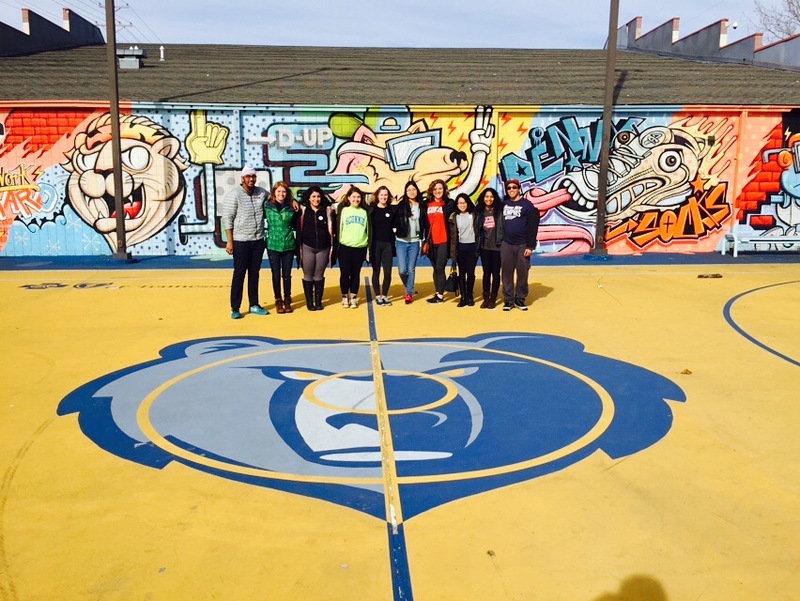 This group visited the Lester Community Center Grizzlies court that was made possible by Memphis's flagship professional sports franchise. The Grizzlies redid these outdoor courts in the fall of 2015 because Memphis is a Hoops City and these outdoor courts are home to some of the country's future Final Four stars. Exploring Beale Street is a must when coming to Memphis. While it's known for being a great time, it also has a rich history that has inspired musicians, storytellers, and visitors for decades. Don't miss it. Asking locals where to go sends you to the cash-only gems like Jerry's Sno Cones. These recommendations rarely disappoint. When you're there, try the Wedding Cake Supreme! Memphis and barbecue are synonymous! Things you should know: Memphis BBQ sandwiches have slaw; we also like dry rub on wings, ribs, or chicken; and BBQ nachos and BBQ spaghetti are things we love. Try it all! Programs that serve kids when the school day ends can have tremendous impact. There are some wonderful organizations in Memphis that use sports, mentoring, and tutoring to support inner-city youth after school. Depending on your group's skill level and desire, we have partnerships in the city to connect with construction service projects. A common urban problem is blight, often resulting from property owners who live outside of the city and don't maintain their property. Vacant homes and unkept lawns hurt struggling neighborhoods. Your group can help fight the blight! This is done in conjunction with community development organizations. There are many refugees and immigrants in our city. Organizations exist in Memphis that help teach English as a second language and help in many other facets of life for these new Memphians. At times we work directly with internationals; we also work on behalf of the amazing partner organizations to help their mission. Help serve meals at the local men’s homeless shelter or cook a meal at a local church that regularly has a meal for their neighbors. We enjoy partnering with St. Jude and Le Bonheur – two of Memphis’s greatest assets that both serve as renowned children’s hospitals. Opportunities include working in one of St. Jude's housing facilities to prepare a meal for a patient’s family who is in town for treatment. The national spotlight is on Memphis as education reform here has been groundbreaking. Schools face pressure from the state to improve, and teachers work hard to find new ways to serve students. Our goal is to come alongside these educators and be their biggest cheerleaders. Serve901 groups have organized libraries, thrown pizza parties for classroom achievement, brought teachers breakfast, and even landscaped around a school campus! Many under-resourced neighborhoods are dubbed food deserts as it can be easier to find junk food than fresh fruit and vegetables. Urban gardens can change that trend, and we support these initiatives by providing manual labor! This also serves as a very practical learning opportunity. Serve901 champions educators and we partner with schools in the city to help in their areas of need. At some schools our groups do landscaping or book organizing in the library; Grizz Prep uses the extra help to do reading testing. Memphis has an incredible park system--and Shelby Farms Park is one of the city's biggest assets. Helping to maintain this gem is fulfilling work. This group planted trees! The City of Memphis is understaffed and that can affect the readiness of the city's amenities for high season. This group cleaned the city pools of leaves and debris from the offseason, getting it ready for neighborhood children to enjoy. Groups serve in several of Memphis's great after school safe spaces. One of these is STREETS Ministries. 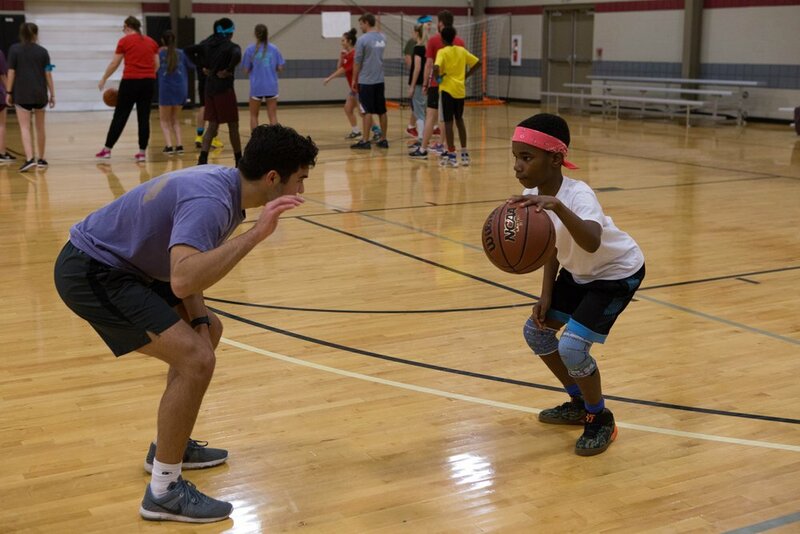 This photo shows a sports camp championed by our group of college students during the local Shelby County spring break. 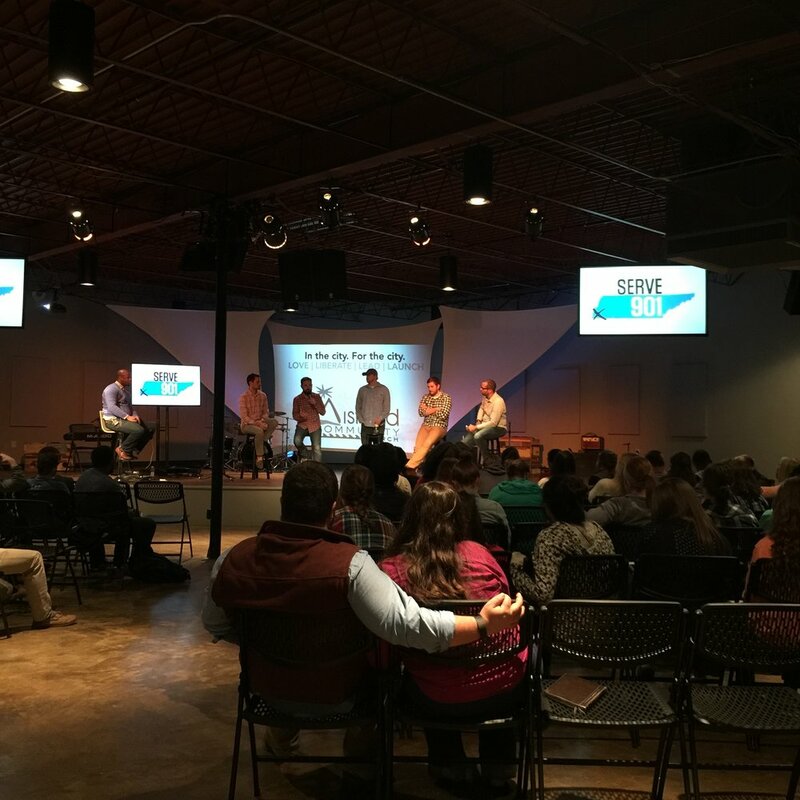 There are many faith-based communities in Memphis that work in underserved communities. This group partnered with a church that owned this neighboring property to give it a much-need exterior paint job. One of the coolest locations for a school project is the New Hope Christian Academy Urban Forest. Soon after they acquired property adjacent to their school, a science teacher pursued a vision for an outdoor education experience. Our groups provide manual labor for the Urban Forest. Not all groups get to do everything in Memphis, but on occasion you'll get the chance to see behind the scenes and witness some of the Memphis mystique. The crew on the left got an inside peek at Clayborn Temple before it reopened in fall of 2016. This site is a Civil Rights Landmark of the city, and was a hub of activity during the Memphis Sanitation Workers Strike that brought Martin Luther King, Jr. to the city. The crew on the right served at Ronald McDonald House and thus got the chance to visit St. Jude Children's Research Hospital. St. Jude provides everything for families experiencing the trauma of childhood cancer. 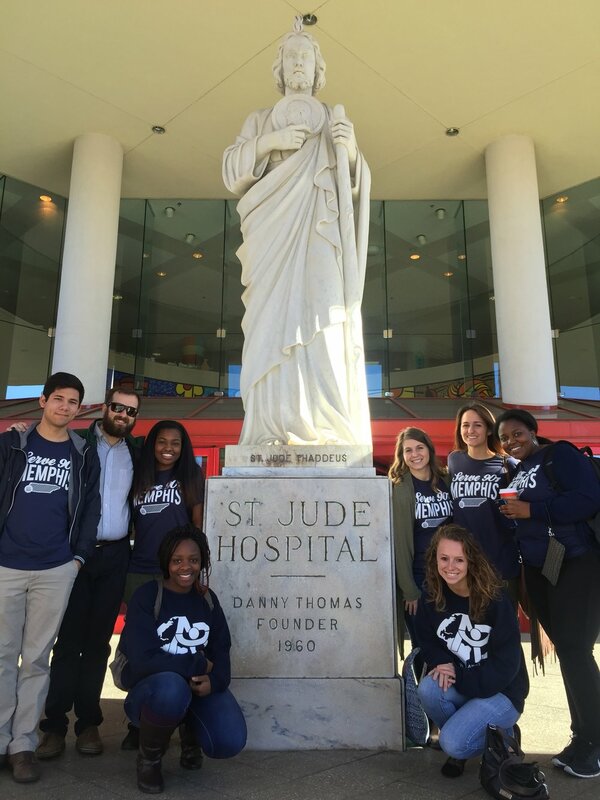 Founder Danny Thomas was proud to pick Memphis as the city for this world reknowned hospital. College is a time for exploring and questioning the world around you. We know that shared experiences like service-learning trips can be made exponentially richer through intentional conversations. We build margin into your schedule so that your group can have space for team reflections and life mapping to better understand your experiences and listen to the perspectives of peers. When multiple groups are in town, students often get the chance to meet and interact with people from other parts of the country and, many times, other countries. Local leaders from Memphis (nonprofit workers and directors, pastors, activists, teachers, etc.) come share about their work in the city. Groups get to ask questions about the journey and mission of these leaders. Topics like poverty alleviation, racial inequity, criminal justice reform, urban education, illiteracy, environmental justice, and various other issues that challenge Memphis' progress are presented in these conversations. We know some issues are similar in other cities, and that the hometowns that our groups represent may have their own social issues. Our hope is that these conversations will influence students to become changemakers in their own communities.